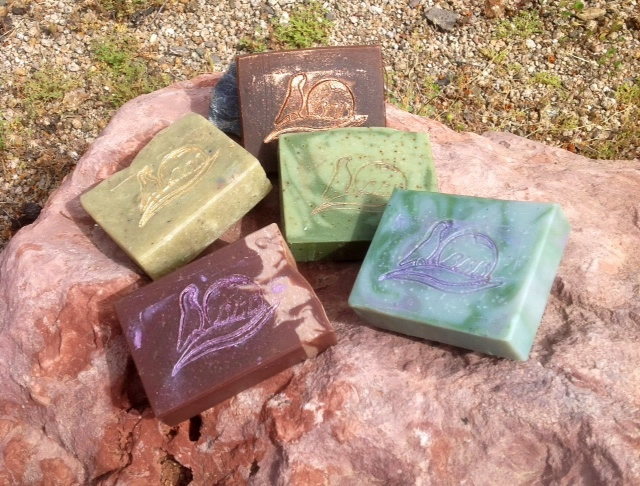 Nestled in the foothills of the North Phoenix Mountains Desert Preserve is the Little Mama Products family-owned microsoapery. My soaps are made in small batches, overflowing with such wonderful oils as olive, shea butter, almond, avocado, cocoa butter, and many others. I specialize in products reflecting the beautiful southwest desert where I live (see Southwest Specialties) but you will also find other favorites, such as Lavender, Lemongrass, Gardenia, several patchouli blends, an assortment of "manly" scents, even old-fashioned Pine Tar...a nice variety of unscented soaps and lotions... well, just step inside my little corner of the web here, and look around! Custom orders are welcomed, too - just contact me for details! IMPENDING SHIPPING MORATORIUM ON LOTIONS AND BODY BUTTER! Yes, summer is coming soon to the desert. We are looking at daytime highs of near 100 already, and I won't be able to ship lotions, creams and body butters in the intense heat. We probably have a few windows of safe shipping weather coming up, but only a FEW, until weather cools back down again some time in October or so. If you are needing any of these products, and cannot make it to the farmer's markets to pick them up in person, now is the time to stock up to get you through the summer! Finally! An all-natural DEODORANT that really WORKS! Check it out in the "Other Treats" section! Did you know that Little Mama Products is on Facebook now? See that little icon in the top right hand corner of this page? Click on it, and come "like" us! It's where we'll post updates and pictures of new products, and the occasional secret special! Let Little Mama Products take care of your shopping and shipping! At no extra charge, we will pack an order using attractive green paper crinkle-shred and enclose a gift card with your personal message. Save time and money - - no need to wait for the order to get to you, and then have to turn around and re-box it and pay shipping again to send it on to another destination! Simply indicate your wishes in the "customer comments" section when you place your order! For all orders over $30.00 within the continental United States! Just $9.95 per address for Priority Shipping! If the actual postage comes to less than $9.95, you will be charged less, of course! I'm sorry, but we do not ship internationally. Please note that the flat-rate shipping applies only to addresses in the continental United States.